From 13 to 16 August I helped Ultra running Ltd (URL) with the organisation of the Thames Ultra Challenge, a set of four Ultra races one after the other covering 184 miles, with the cumulative time taken from all four days. Each day was also an event in itself, so there were a mix of multi and single day runners. I’ve helped organise a few events in the past and can really appreciate the hard work involved. URL in particular do a great job of ensuring each runner have everything they need to help get them to the finish line. It’s quite interesting to see what goes on from an organisational perspective. It can be quite physically demanding, as can supporting a friend through an Ultra event. In some cases I’ve felt better after running an Ultra myself, than I have supporting it. Standing continuously on your feet for several hours, and in some cases missing a full nights’ sleep certainly takes a lot out of you. Day 1 of the Thames Challenge was a 47 mile run from the Thames source to Oxford. In a single day race a runner would try to optimise their pace all the way to the finish line. On a multi-day event like this it is a little different, and it’s interesting to see various run/walk strategies being adopted. There were around a dozen taking part in the whole four day challenge and everyone was of course in high spirits, forming friendships. As the Thames grew from a dry ditch to a stream, I hopped from one aid station to another and it was good to see all runners come through without any problems. I brought a tent with me to the overnight accommodation (behind a pub) to share the experience a little more with the runners. Day 3 continued through Windsor, Staines, ending up at the Kingston Rowing Club. This was now my neck of the woods so I was a lot more comfortable driving around various locks and villages as we moved along the Thames. The weather was perfect and there were no problems with any of the runners. The winner was a female (www.hollyrush.wordpress.com) who Steve told me had run four 2hr37min marathons before taking up Ultra. I didn’t believe him until I checked her out for myself on Power of 10. All four of the Challenge runners made it through the day, and it was a just a marathon (+a few miles) to go. Before I committed to assisting URL with the Thames Challenge I considered the idea of taking part in the final day of the Thames Challenge, the Richmond Ultra. 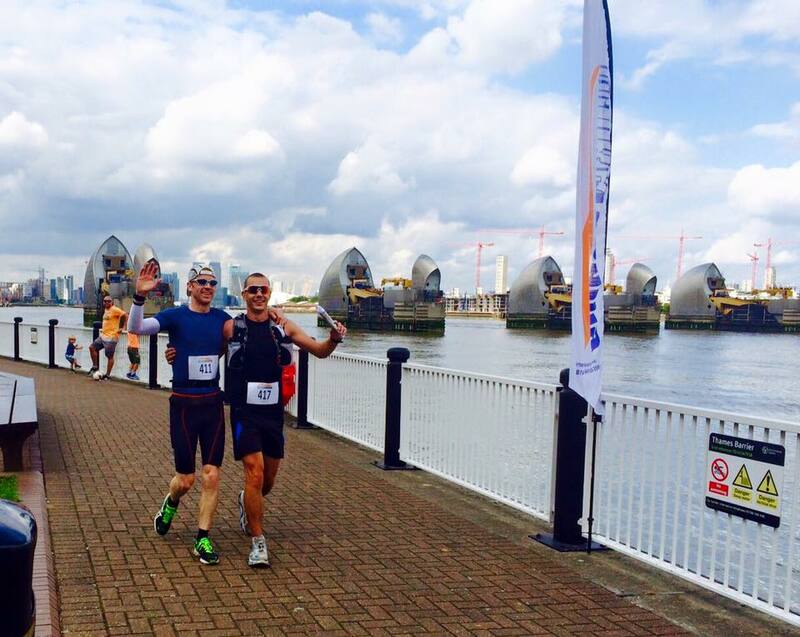 This was the final 30 miles from Kingston to the Thames barrier. I have run the first half of this route a number of times, so know it quite well. I liked the idea of doing an Ultra that followed one of my regular running routes, before taking to the streets of central London and on to Greenwich. My health had been an issue all year once again, and I currently have a couple of conditions both with my throat and chest that require lifestyle changes and checks. My running could just about justify a 10km, not a 50km! But muscle memory and years of base endurance are a wonderful thing and sometimes you can use this to blag your way through the odd race in the medium-term. Despite lack of training I had continued to work a lot more on proprioception / balance and conditioning work, which I find has a huge impact for myself and those I coach. I’d also run a 1500m on grass at a (Civil Service) Departmental Sports Day in 4min50sec, so speed wasn’t an issue. All four of the Thames Challenge runners were still in good spirits despite a number of aches and pains. The fact they had a whole day to complete the final 30 miles meant they could back right off the pace to ensure they finished. There were around 30 starters for the day. At the gun we all started nice and easy, out of respect for each other as much as anything else. By the end of the first mile there were three of us running at 6:45/mile. After a couple more miles one guy dropped back and I found myself running with High Terrain Events runner Paul Wathan. I didn’t think I could race 30 miles at this pace as I was right on the limit. Paul looked very comfortable. He had won a Parkrun event the day before and had the UTMB in two weeks time so was obviously very confident with himself. 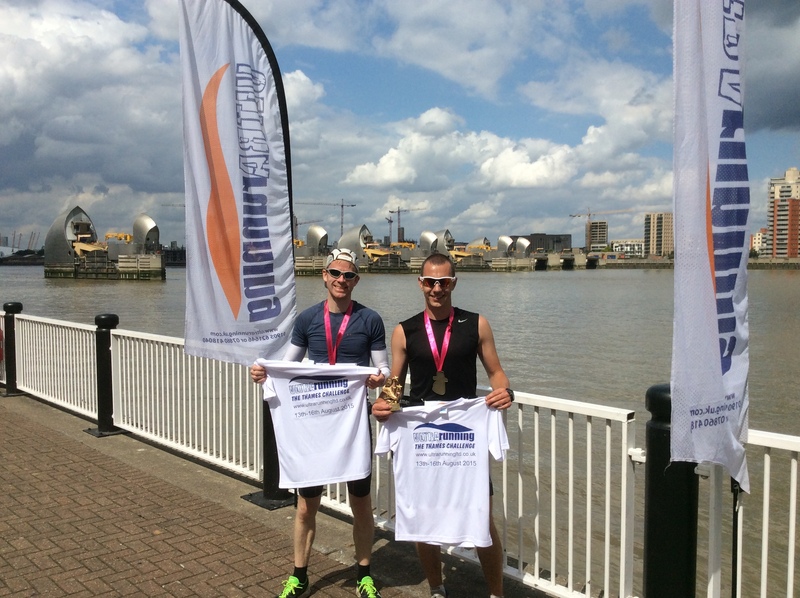 We kept the pace up for the first 18 miles through Putney, Wandsworth, and Battersea. It was a little rough underfoot at first and there were a few times we had to check out the Garmin and map, but it was relatively clean through. I was familiar with the next few miles through Westminster too, having commuted by foot and bike a number of times along the north bank when I worked in Department Environment. Then came the problems. 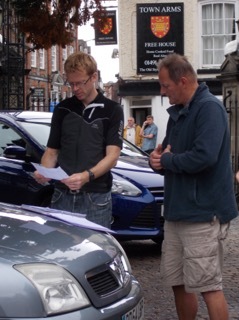 The tourists and traffic were quite fun to negotiate, but the race route wasn’t as got lost a few times trying to find the Thames path and match up the Garmin route on my watch with the maps. After back tracking a few times we started to lose the love for racing and decided to nip into a shop to top up on food and liquid (something I’ve not done in a race before). We did however enjoy our surroundings and the company so decided to stay together to the finish despite the fact I was holding Paul up when I body stiffened in the final miles. We still finished in joint first. I was very pleased to have held the pace for the majority of the race and complete the distance (in a crumpled heap), as I expected and even planned to pull out at one of the check points. The whole four days were a great experience and had some fun with some interesting people. I had a lot of respect for the four runners who managed to complete the whole four day Challenge, breaking some records in the process.